This lets kids join the alpha blonde and her friends as she travels the world as an international fashion spy. Her mission is to investigate and stop the creation of an invisibility suit. Find adventure in Paris, Egypt, Tokyo, and other locations as her special customized jet whisks her around the globe. 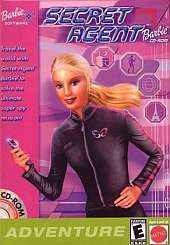 Barbie can run and jump her way through many of the challenges in this game, but her ability to see through deceptions and solve puzzles will often be as important as her impressive athletic prowess. Luckily, specially designed spy gadgets like her "pink-vision" glasses and her remote-controlled puppy dog will help her along the way. Even choosing the right outfit for the task ahead is often a deciding factor in Barbie's ultimate success.